Rambling Moose: Bring Me ... A SHRUBBERY! Monty Python References aside, I was out with the camera again. There is something called The Golden Hour. This is right after sunrise or right before sunset where the colors change. This is known as the time to go and get your favorite camera and take pictures. There will be more gold and orange and fiery highlights at that time of day than at any other. It is especially apparent here in South Florida because at "High Noon" everything is brilliant and the colors have a surreal technicolor quality that I'm still kind of getting used to. Taking the pictures at that time means that you get a broader palate of color with the right subject. This one picture worked out well enough that I dropped it into my background shots directory and will cycle in as time allows. I'm not sure what the name of this particular shrub is. They're very common and very popular here as an accent plant. They don't get very tall, this specimen is about a foot tall. People put them in for a bit of color, and they excel at that. They don't put out any fruit, I've never heard that they spread and I haven't even seen any flowers on them. Do they really need flowers? This one is next door to M.E. DePalma Park in Wilton Manors, but you can see them all over South Florida outside Banks, Restaurants and other commercial buildings where slow growth is prized. I've even seen them inside malls up North. Christiana Mall in Delaware had a row of Palm Trees indoors and a few of these things... basically a plant prison but they looked interesting there. Here we can let our crazy plants roam free until someone gets a wild hair and says that they're invasive. Invasive? Talk about an artificial environment, almost everything that grows here that is showy is imported from somewhere else. 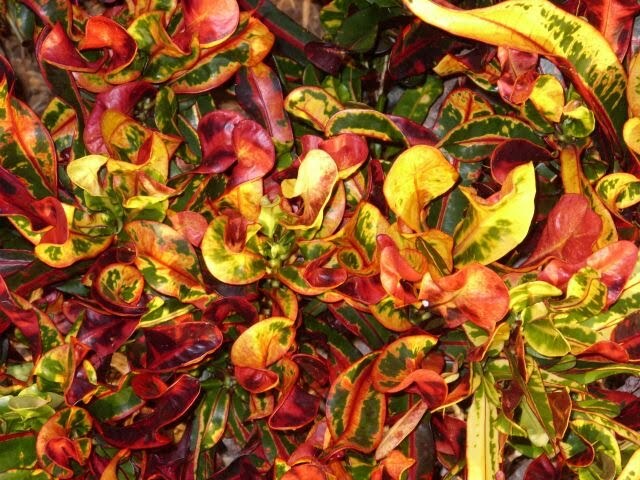 Update: I was told by Diane Cline of the Wilton Manors Main Street and Wilton Manors Historical Society that this particular plant is called a "Croton".